Eat for optimal health with Yasuo's Chi Soup. Yasuo's Chi Soup™ is a great tasting, nutritionally balanced meal that uses the principals of yin and yang to optimize your natural "chi" energy. Chi Soup is made from mostly organic ingredients and is free of additives. These ingredients are layered in the cooking pot according to the principles of yin and yang and steamed with stock made from the highest quality hacho miso from a centuries-old factory in Japan. 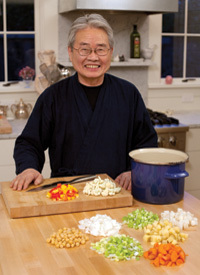 Mr. Mori invites you to experience the benefits of healthy eating for yourself by learning to make it yourself at home through his fun and tasty workshops offered through CE Pulse.